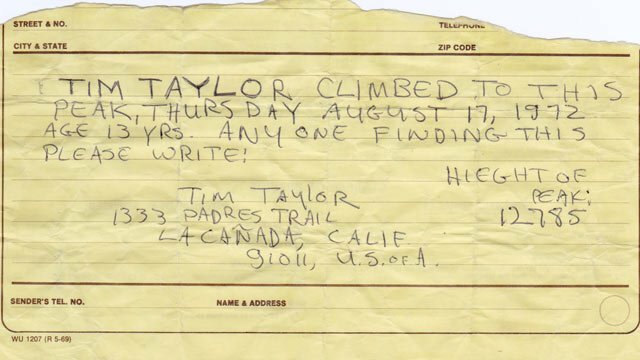 Tim Taylor's handwritten note was discovered by 69 year old Larry Wright with his son and grandson on 9/8/12. You can read the story by Reporter Dina Abou Salem here; and an update here. – Combined with a small piece of PAPER – he PLANTED his SEED in an ancient art form called WRITING! Decades later, it is found – still in contact with the soil it was planted in. Surviving 40 years of WIND, RAIN, SUN, SNOW, and SOIL…. still in prime condition! This SPEAKS volumes to me today. The note was written on two very significant dates in the history of my life. I am a writer – a lover of the written WORD! This ancient technology survived the test of TIME! In its finding…it physically connected 4 generations…with the watching world! For some unrevealed reason, I am filled with HOPE today. HOPE for new HUMAN CONNECTIONS… RESTORATIONS….and REAVEALED DREAMS. Was this just happenstance – or a God appointed find? I can’t say. But we are all connected in some way to each other and the world around us through the Creator God. We may not be privy to how it unfolds. But a door has been opened. Opportunities are there that were not there before the find. These opportunities were planted as an unknowing SEED of HOPE… 4 decades ago. This seed of HOPE was planted by a young teen in expectation of a HARVEST. The very words on the note reveal such. The very fact that he wrote the note, sealed it in a waterproof canister, and buried it….shouts of an expected HARVEST! May his NOW HARVEST overwhelm him with new opportunities of JOY…and unknown EXPECTATIONS. May he continue to plant with expectations for tomorrow's find. Seeds fall to the ground all the time…some are picked up by the wind and blown for miles and miles – on wings of the air we breathe. Others lay stagnant in the rocks - incapable of making contact with the soil. But there are those SEEDS that are intentionally PLANTED – carefully placed and protected by a prayer...an expectation... a promise or hope. Those are the SEEDS that Birth a HARVEST….even generations down the road. Protect your seed! It is priceless. Intentionally PLANT…..and in your planting, EXPECT the HARVEST to come! One tiny seed has the DNA and the capacity to bring about a full Harvest. This same ancient art form was used to establish the life and ministry of JESUS CHRIST - the one and ONLY Son of God - who also walked this earth – its peaks and its valleys. This Christ spoke WORDS of LIFE to the waiting, watching, seeking world. It was recorded by this same ancient art form –in what is known as the HOLY BIBLE…the inherent WORD of God. It too has stood the test of TIME. Generations yet unborn will read it - and new HOPE will be birthed in their hearts… with its hearing! Read a portion of this JESUS’… PLANTING - a message He planted in the hearts of men, women, and children of His day – for such a time as this. the Lord. in the beginning was the WORD . . .
What a JOY to see you here. Thank you for your visit and for picking up the pencil. John 1:1 "In the beginning the Word already existed. The Word was with God, and the Word was God"
Question for today- "What am i planting today- for tomorrow's find? " yeah Dayor....takes some time to ponder it - bathe it in prayer..and then just do it. Thanks for visiting and picking up the pencil. Another profound piece of beautiful and thought searching writing...especially as I go through boxes of letters from our parents,relatives, dividing them to give back to the writer along with pictures, but mostly writing. My prayer is it will connect something that will heal from the past for the present day....some I had written and never mailed to an estranged brother....collecting the written words for when I pray he will recieve the balm of Christ's love in them and not condemnation.....after so many years, it all only matters if it goes back to or begins in Christ and what He came or was sent here to do....He planted the only thing that ultimately has worth of life....I pray I can read this over and over and He will speak to my heart in certain situations and what I can plant to help heal..... much work through Him to be done....unfinished work a head ....even in myself. Thank YOU for your obedient heart and the LOVE you have for us through HIM. Sherry Green Peck....my computer died so I am on another until I get the new one....Hugs bountiful hugs to you!! so sorry your computer died! Mine died in 2010. I lost everything that hadn't been copied or moved to my external drive. Such a big loss for me...as a writer. I know you depended on yours for so much too. you are going through all the same things I did when going through mom and dad's house before the sale. 2 months of digging, sorting, throwing and keeping....memories ... memories ... memories. At some point, I become so burdened with letters and such that I didn't think I could finish the task before me. Too much information over whelmed me with unsolicited thots. The enemy camps on these old memories and tries to keep us bound. It was one of the most exhausting things I've had to do. And yet, it is all now behind me! it was an exercise in faith, and dependance on God...to say the least. I couldn't have accomplished all that I did without His steady hand on and over me. I am saddened to hear that we seem to have similar situations with estranged brothers. I have two. I used to spend a lot of time trying to figure it all out. But It just is what it is. I bathe them in prayer and expect that one day i will see them in heaven - all of us healed and whole...but this side of heaven would be a blessed miracle to see them face to face and know that all is forgiven and accept each other as the family we were born into. 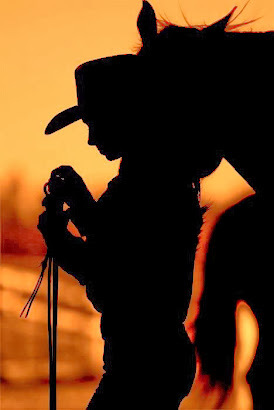 I have learned to give my painfully stretched heart strings to the Lord. He knows all our hearts and I have given my heart to Him for safe keeping. You're right....the important thing is what Christ came for... to set the record straight... to clear the slate...to set us free. I loved how you said "He planted the only thing that ultimately has worth of life." I like you idea of ...Planting to heal! Yes yes. And plant with expectations of healing. There is much 'unfinished' work in all of us, dear soul - whether we like to admit it or not. We are all a work in progress. Scripture says we move from glory to glory. Never remaining the same...never stagnant. Always hoping for that mark of wholeness. Just walk...it will be ok.
2 Cor 3:18 "But we all, with open face beholding as in a glass the glory of the Lord, are changed into the same image from glory to glory, even as by the Spirit of the Lord." 1 Corinthians 13:12 "Now we see but a poor reflection as in a mirror; then we shall see face to face. Now I know in part; then I shall know fully, even as I am fully known"
1 John 3:2 "Dear friends, now we are children of God, and what we will be has not yet been made known. But we know that when he appears, we shall be like him, for we shall see him as he is." 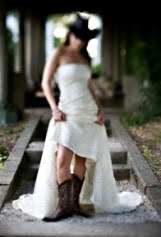 what a lovely story, and a lovely post. I believe too that we are all connected, and I feel even more so since I started blogging that time and space mean nothing at all. I have left a message on the post you visited on my lighthouse blog in answer to your comment. my day has unfolded with you...so glad we were connected. Thank you so much for your comments about my shared dream at your place. I am bathing you and your lighthouse in prayer. I love the way the Lord speaks to you and how you are not the least bit fearful... to answer His call. I love the fact that you are a fellow 'dreamer'. Looking forward to a long a prosperous connection here in bloggvile. 1 Corinthians 12:7 "Now to each one the manifestation of the Spirit is given for the common good"
1 Cor 12:12 "The body is a unit, though it is made up of many parts; and though all its parts are many, they form one body. So it is with Christ"
I'm going to take the question you posed and really ponder on what I'm planting with the expectation to found. Very thought provoking piece Patrina. thanks for visiting and picking up the pencil. Glad you are 'pondering' the posed question. I am still pondering too. It will be a progressive thing, I believe, as I move and breathe in His Presence. I think there is much to be planted. But I also think that we've been planting all along and we just haven't recognized it. What I posed is to do an intentional planting...with an expected harvest. Such as...for the past 8 years, I have journaled my dreams ...and God's revelation. I have 20 some handwritten journals that have become my spiritual walk with the Lord. I have the expectation that even after I am gone ... they will live on...to bring healing and hope to those left behind... not just family...but I have a hope that they will survive even after the 'rapture' and plant seeds of hope and the healing of Salvation to those left behind. These journals are full of hope in Christ Jesus... much like our blogs....but on a much more personal level. For the past 2 years I have jornaled the same ...only electronically. 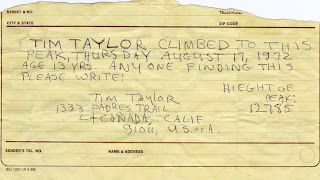 But with this story of Tim Taylor's handwritten note...I am considering going back to the handwritten journals... they can be smuggled into hidden places easier than even a small device that has to connect to the web to be read. :) I have seriously given this thot. The big drawback of the handwritten journals....I tend to think faster than my pen can keep up...so my penmanship is sometimes even unreadable to me ...years down the road :) I really need to work on that! 1 Thessalonians 4:17 "Then we which are alive and remain shall be caught up together with them in the clouds, to meet the Lord in the air: and so shall we ever be with the Lord. It is like GOD'S words written boldly into our hearts...never fades away even when storms, rain ans wind comes down on us..HIS words are in us, giving us courage and strength. p.s this brings to the question Texting vs writing.....we are losing the skill. Exactly! because God's WORD is living. It has never perished from the land. Never changed...remains the same generation after generation! It is the one Book we can put our trust in. We are losing the skill of this ancient art form! At some point, no one will be able to read the art of 'cursive' writing...because were so inundated with the typed text! the times...they are a changing. Good to be in touch with you...miss you. Thanks so much for stopping by and picking up the pencil. Heb 4:12 "For the word of God is living and active. Sharper than any double-edged sword, it penetrates even to dividing soul and spirit, joints and marrow; it judges the thoughts and attitudes of the heart." 1 Thessalonians 2:13 "And we also thank God continually because, when you received the word of God, which you heard from us, you accepted it not as the word of men, but as it actually is, the word of God, which is at work in you who believe." This was so interesting Patrina. I lived only a few miles away from La Canada in Pasadena. Your message from this note and pencil is so challenging... planting the seeds - it becomes more important with each passing day. This life is the only one we have, and the days are passing... it's a challenge to me every time I think about it. It's TIME to do what we claim, every day, it's become my own theme too. "It's TIME to do what we claim, every day"
I say, live our life on purpose! make a claim and live it intentionally. Yes, it was good to hear God's take on this one little story. I first wrote His response in my journal...then decided to post it. But I always have to tweak my journal entries to fit a public post. Thanks so much for visiting and picking up the pencil! 2 Peter3:8 "But you must not forget this one thing, dear friends: A day is like a thousand years to the Lord, and a thousand years is like a day." Romans 15:5 "May the God who gives endurance and encouragement give you a spirit of unity among yourselves as you follow Christ Jesus"
Phil 2:2 '...then make my joy complete by being like-minded, having the same love, being one in spirit and purpose"
Hola, me gustó tu blog, con tu permiso, te sigo. I jumped over to your place and did a lot of 'translating' ..try to find a bit about you and what you blog about. With almost 3000 followers, I could not believe that you responded to each and every one...every time. That in itself, tells me a few things. As I was about to comment, I see that you have chosen to close comments - so you can rest from being the "responder". Life gets pretty hectic when you try to respond to that many followers. That's why we have administrators and then administrative assistants :) I'm proud of you for trying to find balance. Just make sure you are still 'planting' for tomorrow's find. Life isn't all about today. It has its past...as well as a future. Amos 4:13 "He who forms the mountains, creates the wind, and reveals his thoughts to man, he who turns dawn to darkness, and treads the high places of the earth--the LORD God Almighty is his name." Psalm 139:23 "Search me, O God, and know my heart; test me and know my anxious thoughts." Faith seeds, planted here and there and along the way! God knows the kingdom harvest that is coming for each one of us. We may not see it now, but we can be certain God has seen it all. Love this story, Patrina, and love the hope you radiate through your pen. thanks for picking up the pencil and for your kind words. 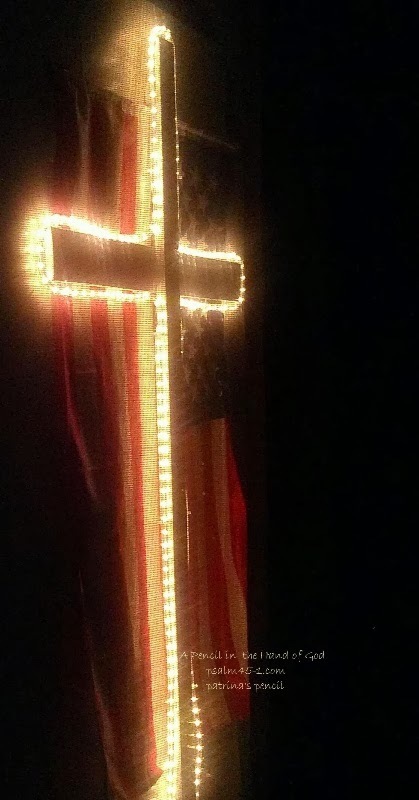 Yes, we can be certain that God has seen it all. Romans 15:13 "I pray that God, the source of hope, will fill you completely with joy and peace because you trust in him. Then you will overflow with confident hope through the power of the Holy Spirit." 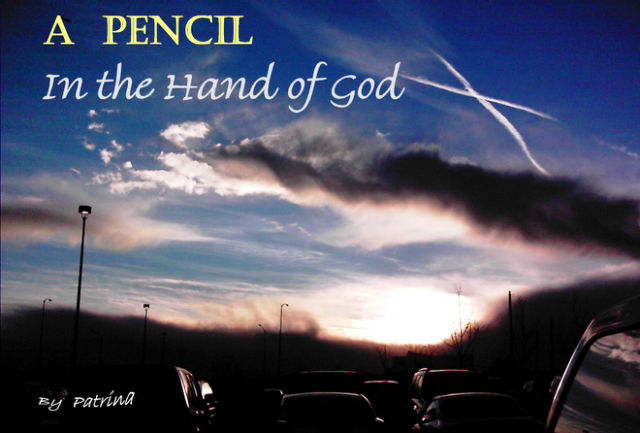 For a pencil to write it takes substance from itself; gradually it comes to nothing and leaves the message. There's a word for a Christian in that: the apostle Paul an example of it. "gradually it comes to nothing and leaves the message." That's how I feel about my writing. I know when the transformation occurs :) When I cease to write...and the Holy Spirit takes over and leaves the intended message. The apostle paul is a great example! Thanks for picking up the pencil, David. lol....Kafo... yes... this is deep. I am a deep thinker :) I hear your delima...you are a busy soul. We all are, I believe. But we must take time out to ask some deep questions of ourselves... and seek God's will in our lives.... or we will be consumed by our busyness. I believe we get more accomplished with consistent time-outs with God... an hour with God is worth more than a thousand hours with our other responsibilities... He doubles our effectiveness... for the rest of the day... we give so much of us away to these other 'things' that rightly so... have an importance in our life.... but it is my experience that when I start my day full of God... I'm more able to maneuver my way throughout my day....and remain standing at the end of the day. Praying for a more relaxed day(s) for you with all your deadlines... may your future be fruitful with a large harvest. God is good... He is faithful all the time..
dear, friend... I will be send you an e-mail... Sad that your computer died.. I know the feeling so well. I think of you often, and pray for your daily ordeal of going through memories....and memories... and making the decisions to keep or give away. Very exhausting. I anticipate that glorious day when you are moved into your new home and settled... so your heart and mind can settle too. We need to be planted... I too am not planted here. I have begun to teach a Beth Moore Study in my home... to stretch myself out of my 'comfort zone' (I've never taught a Bible Study) ...and to plant myself in the lives of those around me. I visited your place today.... haha... much joy was released in me when I read your story of the little Barbie 'undies'. I could feel the joy that you experienced while making them... just pure joy.